Iraq to Require Lengthy U.S. Military Presence Speaking from the Oval Office, President Bush says Iraq needs a U.S. military presence that will last beyond his time in office. In the short term, he calls for modest reductions to bring 5,700 military personnel home by Christmas. Speaking from the Oval Office, President Bush says Iraq needs a U.S. military presence that will last beyond his time in office. In the short term, he calls for modest reductions to bring 5,700 military personnel home by Christmas. President Bush spoke to the American people from the Oval Office last night, arguing one more time for continuing the U.S. military operation in Iraq. This time, the president promised something different, a troop reduction by Christmas saying the buildup he ordered earlier this year was yielding results. But the president also stated that Iraq will rely on a long-term U.S. military presence extending beyond his presidency. DON GONYEA: It was the classic presidential setting: the desk in the Oval Office, pictures of wife and daughters and the family dog visible on the shelf behind him. The president stared at the camera and raised the stakes as high as he could. President GEORGE W. BUSH: Good evening. In the life of all free nations, there come moments that decide the direction of a country and reveal the character of its people. We are now at such a moment. GONYEA: The president portrayed Iraq as an ally fighting for survival against terrorists and extremists who, if successful, will also attack the U.S. at home. Iraq he said has placed its trust in the United States. Pres. BUSH: And tonight, our moral and strategic imperatives are one: we must help Iraq defeat those who threaten its future and also threaten ours. GONYEA: From there, he made the case for continuing the mission, citing testimony before Congress this week by General David Petraeus and Ambassador Ryan Crocker, claiming the so-called troop surge is working. He endorsed Petraeus' assessment that the number of U.S. brigades in Iraq could be reduced from the current 20 down to 15 by next July. If that plays out, it would likely still leave the total U.S. force at or above the roughly 130,000 in Iraq before the surge swelled the ranks. But he offered no specific promise beyond 5,700 troops to be brought home by Christmas. The president pointed to Anbar province, a huge desert region to the west of Baghdad, as a success story. Mr. Bush noted that a year ago, Anbar was an al-Qaida stronghold, with local Sunni leaders working alongside those attacking U.S. troops. But in Anbar this year, Sunni sheikhs began working with U.S. forces to stop the violence. That and an increase in 4,000 Marines have brought the number of attacks way down. Pres. BUSH: Anbar citizens who once feared beheading for talking to an American or Iraqi soldier now come forward to tell us where the terrorists are hiding. GONYEA: But the Anbar story, a White House staple this summer, was tempered by some bad news. One of the Sunni leaders in Anbar Mr. Bush met with just last Monday in Iraq, died yesterday in a roadside bombing of his armored vehicle. The president spoke of that attack last night. Pres. BUSH: In Anbar, the enemy remains active and deadly. Earlier today, one of the brave tribal sheikhs who helped lead the revolt against al-Qaida was murdered. In response, a fellow Sunni leader declared, we are determined to strike back and continue our work. GONYEA: The president spent much less time, just one paragraph, in an 18-minute speech on the troubled Iraqi government and its failure to meet benchmarks for political progress. That failure will be reiterated in a fresh White House report to be released today. That's why the president has cut back on bold predictions of victory. In a passage last night, that was immediately seized upon by the president's critics, he spoke of a long range U.S. presence in Iraq. He said the idea has the backing of leaders from across Iraq. Pres. BUSH: These Iraqi leaders have asked for an enduring relationship with America. And we are ready to begin building that relationship in a way that protects our interests in the region and requires many fewer American troops. GONYEA: The president seemed well aware his war policy has not been popular. But it was just as clear he was determined to press on. Pres. BUSH: Some say the gains we are making in Iraq come too late. They are mistaken. It is never too late to deal a blow to al-Qaida. It is never too late to advance freedom. And it is never too late to support our troops in a fight they can win. GONYEA: Ultimately, Mr. Bush's goal seems not to move the majority in the polls, but to shore up his own political base. If enough Republicans remain willing to stand by him, the Democrats in Congress will not have enough votes to dictate Iraq policy on their own. Don Gonyea, NPR News, Washington. President Bush, defending an unpopular war, ordered gradual reductions in U.S. forces in Iraq on Thursday night and said, "The more successful we are, the more American troops can return home." Still, Bush firmly rejected calls to end the war, saying the insurgents who threaten Iraq's future are a danger to U.S. national security. American troops must stay in the battle, Bush said, and more than 130,000 will remain after the newly ordered withdrawals are completed in July. "The principle guiding my decisions on troop levels in Iraq is: return on success," the president said. Bush said 5,700 U.S. forces would be home by Christmas and that four brigades — at least 21,500 troops — would return by July, along with an undetermined number of support forces. Now at its highest level of the war, the U.S. troop strength stands at 168,000. With no dramatic change in course, Bush's decision sets the stage for a fiery political debate in Congress and on the 2008 presidential campaign trail. Democrats said Bush's modest approach was unacceptable. Sen. Jack Reed of Rhode Island, a former Army Ranger who delivered the Democratic response, said that "once again, the president failed to provide either a plan to successfully end the war or a convincing rationale to continue it." Reed said Democrats would work to "profoundly change our military involvement in Iraq." The reductions announced by Bush represented only a slight hastening of the originally scheduled end of the troop increase that Bush announced in January. When the cutbacks are complete, about 132,000 U.S. forces will be in Iraq. Bush's speech was the latest turning point in a 4½-year-old war marred by miscalculations, surprises and setbacks. Almost since the fall of Baghdad, in April 2003, U.S. commanders and administration officials in Washington mistakenly believed they were on track to winding down U.S. involvement and handing off to the Iraqis. Instead, the insurgency intervened, and the reality of a country in chaos conspired to deepen the U.S. commitment. Bush said the U.S. engagement in Iraq will stretch beyond his presidency, requiring military, financial and political support from Washington. He said Iraqi leaders "have asked for an enduring relationship with America. "And we are ready to begin building that relationship in a way that protects our interests in the region and requires many fewer American troops." Bush described the withdrawals, and the U.S. forces still fighting in Iraq, as a compromise on which war supporters and opponents could agree. "The way forward I have described tonight makes it possible, for the first time in years, for people who have been on opposite sides of this difficult debate to come together," Bush said. That appeared highly unlikely, however, based on the reaction of Democratic leaders who want deadlines for withdrawals. "The American people long ago lost faith in the president's leadership of the war in Iraq because his rhetoric has never matched the reality on the ground," said House Speaker Nancy Pelosi (D-CA). "The choice is between a Democratic plan for responsible redeployment and the president's plan for an endless war in Iraq." Majority Democrats in Congress are unable to muster enough votes to force an end to the war. So they are hoping to win Republican support with legislation to limit the mission of U.S. forces to training Iraq's military and police, protecting U.S. assets and fighting terrorists. Addressing America's frustration with the protracted war, the president said, "Some say the gains we are making in Iraq come too late. They are mistaken. It is never too late to deal a blow to al-Qaida. It is never too late to advance freedom. And it is never too late to support our troops in a fight they can win." "Whatever political party you belong to, whatever your position on Iraq, we should be able to agree that America has a vital interest in preventing chaos and providing hope in the Middle East," the president said. He added, "Let us come together on a policy of strength in the Middle East." In his speech, Bush acknowledged that Iraq's government has failed to meet goals for political reconciliation and security. "In my meetings with Iraqi leaders," he said, "I have made it clear that they must." 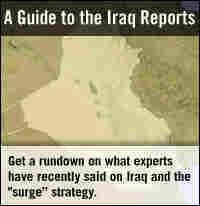 A White House report, to be released Friday, will document the failures of the Iraqi government. The latest conclusions largely track a comparable assessment in July, the White House said. The earlier report said the Iraqi government had made satisfactory gains toward eight benchmarks, unsatisfactory marks on eight and mixed results on the rest. A senior administration official said Thursday that only one of the benchmarks — enacting and implementing legislation to allow former lower ranking members of Saddam Hussein's Baath Party to hold government positions — has moved from unsatisfactory to satisfactory. The official, who spoke on condition of anonymity because the report had not been made public, pointed to the tentative Aug. 26 power-sharing agreement among leading Iraqi politicians that outlined major terms on several issues, including changing the law preventing many former Baath Party members from holding government jobs and elected office. "Iraq's national leaders are getting some things done," Bush contended. He said the Baghdad government has passed a budget and is sharing oil revenues among the provinces even though legislation has not been approved. Changes that have begun to take hold in the provinces must be followed in Baghdad, he said. Bush's claims of security progress in Iraq were jarred by the assassination of a Sunni sheik who revolted against al-Qaida and fought alongside Americans. Abdul-Sattar Abu Risha, the most prominent figure in a U.S.-backed revolt of Sunni sheiks against al-Qaida in Iraq, was killed Thursday by a bomb, dramatizing the danger faced by people who cooperate with coalition forces. Bush had met with the sheik 10 days ago during a visit to Anbar province. Bush said that after the sheik's death, a fellow Sunni leader pledged to continue working with the United States. "And as they do," the president said, "they can count on the continued support of the United States." He said Anbar, once considered lost to al-Qaida, shows what can happen across Iraq. "They show al-Qaida that it cannot count on popular support, even in a province its leaders once declared their home base." Bush said he had directed Gen. David Petraeus, the top U.S. commander in Iraq, and Ryan Crocker, the U.S. ambassador to Iraq, to report to Congress in March with their next assessment of developments in Iraq and the level of U.S. troops needed to handle security. "Americans want our country to be safe and our troops to begin coming home from Iraq," Bush said. He said his strategy would permit "people on opposite sides of this difficult debate to come together." Polls show that Americans overwhelmingly disapprove of Bush's handling of the war, which has claimed the lives of more than 3,700 U.S. troops and cost about a half trillion dollars. His approval rating — both for his handling of Iraq and for his overall performance — stood at 33 percent in an Associated Press-Ipsos poll released Thursday. 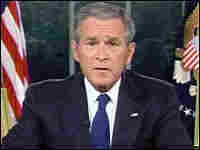 In his speech, Bush directed specific messages to different audiences. To Congress, he sought support for Petraeus' recommendations on troop levels. To Iraqis, he said, "You must demand that your leaders make the tough choices needed to achieve reconciliation." To Iraq's neighbors, he said efforts by Iran and Syria to undermine the government in Baghdad must end and that "the violent extremists who target Iraq are also targeting you." To the international community, he appealed for help in revitalizing Iraq's economy and support for an expanded mission of the United Nations in Iraq. To U.S. military personnel, intelligence officers, diplomats and civilians on the front line, he said, "You have done everything America has asked of you."